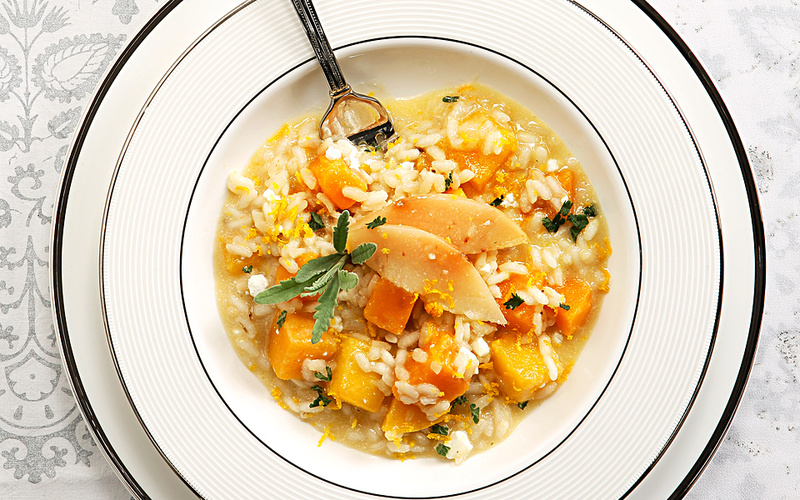 The chef from Grande Bretagne presents a new take on the classic risotto. The humble risotto gets a new lease of life with the addition of winter vegetables, goat's cheese and mandarin zest. The Chef de Cuisine at the Grande Bretagne Hotel’s Roof Garden restaurant, Asterios Koustoudis, recommends a fragrant risotto with the par excellence winter vegetable, pumpkin, the pungent flavor of goat’s cheese and the sweet fruitiness of quince, a dish influenced by Macedonian and Italian cuisine. Preheat the oven to 180 Celsius. Slice the quince in half and place on a baking tray skin-side up. Add the wine and cinnamon, cover with tin foil and bake for approximately 30’ until soft. Remove foil and bake for another 15’ to caramelize. Place in a bowl with the syrup and set aside. Meanwhile, in a broad saucepan, heat the oil over medium heat and sauté the pumpkin with the rosemary, onion and garlic for 3-4 minutes. Add the liqueur and simmer for 2’. Then add the rice, stirring for 3-4’ until glazed. Use a ladle to gradually add the vegetable stock, stirring with every new ladleful. The process should take around 20-25 minutes until the rice is cooked but still has a firm bite. Add the mandarin zest, butter, cheese and salt and pepper to taste before removing from heat. Rest for 3’ before serving with 2-3 slices of quince and some of their syrup drizzled over the top. * Originally published in Gastronomos Magazine, Dec 15 Issue. A taste of Greece in every bite.